Former Soviet Head of State Mikhail Gorbachev gives a speech on the occasion of a ceremony at the 'Konrad-Adenauer-Stiftung' (Konrad Adenauer Foundation) in Berlin, Germany, Oct. 31, 2009. Former Soviet leader Mikhail Gorbachev and ex-U.S. President George H. W. Bush intend to contribute to normalizing the relations between Russia and the United States, the Gorbachev Foundation press office told TASS on Oct. 19. The relevant agreement was reached during a telephone talk between Gorbachev, George H. W. Bush and former U.S. Secretary of State James Baker, the press office said. "Our experience is the cessation of the cold war and the arms race. During those years, our countries - the USSR and the U.S. - went through difficult trials and came out of them both in Europe and in the Middle East in a dignified manner," Gorbachev said in the telephone talk, noting the importance of a constant dialog. "This should be an example for current politicians," the former Soviet president said. "A compromise can be found in the most difficult situations. And now the goal should be to find a compromise taking into account the parties’ interests. And no one should declare a victory. 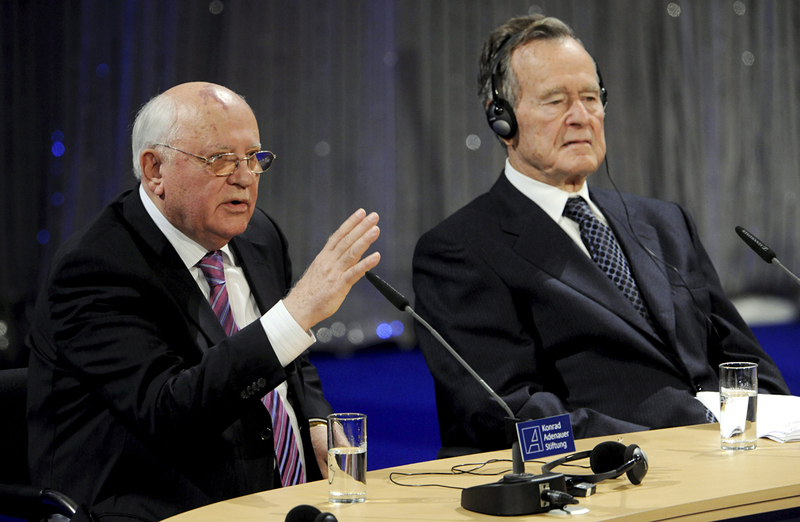 If we come out of the current impasse, this will be a common victory," Gorbachev said. The Gorbachev Foundation press office said that George H. W. Bush and Baker had agreed with that. "The interlocutors agreed that they will seek to contribute to normalizing the relations and restoring cooperation between the two countries. They will think about the steps, including joint measures, they could take for this," the press office said in a statement obtained by TASS.